My daughter drove down from Cleveland with her dog on Friday night and spent the weekend here. We enjoyed her visit and were glad she took the time out of a busy schedule to come and see us. All too soon, she packed up her car to leave this morning. 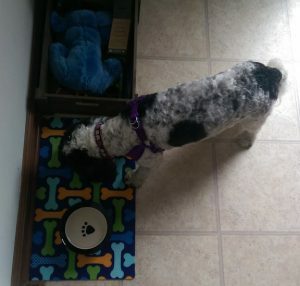 Here’s a photo of the dog eating breakfast just before getting on the road, already wearing the little harness that attaches to the doggie car seat. At first I wasn’t sure if I should write about a family visit in a Good Things post, as it was not unexpected. Also, how did it fit into the theme of good stuff replacing clutter and stagnation? Although there was indeed some physical clutter when dog and daughter were living here, my husband often reminded me (when I stepped on a chew toy or something and got cranky about it) that I should appreciate the moment because they would be gone soon enough, and all we’d have would be occasional visits. So, I would say that what I cleared away to make space for good family visits was not the physical clutter. Rather, it was the bad habit of letting myself get annoyed about stuff that really didn’t matter. That’s all too easy to do; and in truth, it is just mental garbage taking up space where good things could go instead!